The word Triangle can be split as tri and angle, meaning three angles. Definition: ‘Triangle’ is a closed figure formed by three distinct (non-collinear) line segments. We know that sum of angles in a triangle is 1800. Let us prove this, mathematically. 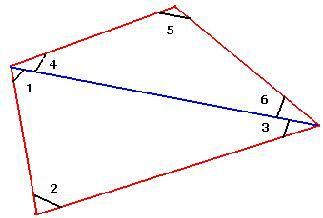 6.4.1 Theorem 1: In any triangle sum of the three angles is 1800. By theorem on parallel lines as EF is || BC and AB is transversal. By theorem on parallel lines as EF is || BC and A is transversal. 6.4.1 Problem 1: If one angle of an isosceles triangle is 400 find the other two angles. Note: In an isosceles triangle two angles are equal. We also know that sum of all angles in a triangle is 1800. The angles of the triangle are 400,400 and 1000. 6.4.1 Problem 2: Find the angles of an equiangular (equilateral) triangle. Note: All The angles of an equiangular (equilateral) triangle are equal. Also sum of all angles in a triangle = 1800. Definition: If any side of a triangle is extended, the angle formed at the vertex is called an ‘exterior’ angle. The two angles inside the triangle, opposite to the adjacent angleof the exterior angle are called ‘interior opposite’ angles. Note that since triangles have three sides, they have three exterior angles. 6.4.1 Theorem 2: If one of the sides of a triangle is extended, the exterior angle so formed is equal to sum of interior opposite angles. 6.4.1 Problem 3: An exterior angle of a triangle is 900 and one interior opposite angle is 450. Find the remaining angle of the triangle. Let x be the other interior angle of the triangle. We know that, exterior angle of a triangle = sum of interior opposite angles. 6.4.1 Problem 4: Find all the angles in the triangle given below. Since 1000 is the exterior angle at vertex B, its interior opposite angles are p and q. Since 1300 is the exterior angle at vertex C, its interior opposite angles are r and q. By substituting this value of r in (2) we get q= 500. By substituting this value of q in (1) we get p= 500. Therefore 500,500 and 800 are the values of p, q and r respectively. 6.4.1 Problem 5: Prove that sum of the angles of a quadrilateral is 4 right angles. Any quadrilateral can be divided in to 2 triangles and sum of angles in a triangle is 2 right angles. I.e. 2A = B+50 = (180-C-A)+50 = 230 –C –A. On substituting this value of C in (2) we get A =60. The angles are A = 60, B=70 and C=50. We have to prove that POQ = 900. We have seen that a triangle has 3 measurable angles and 3 measurable sides and thus in all has six elements. But to construct a triangle uniquely, we do not need all the six elements. We just need three elements, one of which has to be a side. 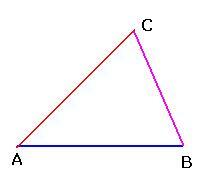 6.4.2 Problem 1: Construct a triangle ABC with AB = 3cm, BC = 4cm and AC = 5cm. First draw a rough figure of the triangle ABC. With A as center cut a large arc of radius 5cm. With B as center cut a large arc of radius 4cm. 6.4.2 Problem 2: A field is in the shape of an equilateral triangle. Perimeter of the field is 2490 Meters. Construct the triangle with suitable scale. We know that the perimeter of a triangle is the sum of all its side. Since it is given that the field is an equilateral triangle, all its sides are equal. Since it will be difficult to construct a triangle of side = 830 meters, we can use the scale of 100meters = 1cm to construct the triangle. We need to construct an equilateral triangle with side = 8.3cm. Since all the sides of an equilateral triangle are same, we need to construct a triangle with sides 8.3cm, 8.3cm and 8.3cm. Exercise: Follow the method described in 6.4.2 problem 1(above) to construct the triangle. Note: The above method is used for constructing a right angled triangle with 2 sides given. You must have seen ponds. Have you ever thought of finding the width of the pond without getting into the water? Similarly will it be possible to find the width of a river without getting into water? Geometry helps us in solving such problems which we encounter in our daily life. two figures are congruent if they have similar properties (i.e. when we super impose one figure over the other, they fit in exactly without variations). The ‘corresponding angles’ are the angles opposite to the sides which are equal in two triangles. 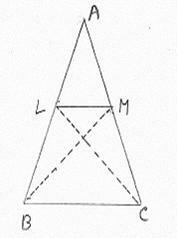 Two Triangles are said to be ‘congruent’ if the corresponding three sides and three angles of both triangles are equal. Observation: Two congruent triangles have equal area because they fit in exactly when superimposed. with the following three elements (data). Note that when we are given only three angles, we can construct several triangles. Note: Given, length of two sides and an angle other their included angle we can not construct a unique triangle. In the adjacent figure, length AB and AC are given and also the angle BAC. 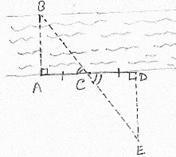 Extend AC and let D be a point on this extended line such that BC =BD. and BAC as common angle). Note: If 2 angles are given, the third angle can easily be found as the sum of 3 angles in a triangle is 1800. Observation: As per the definition of congruency, for congruence, all the corresponding 3 sides and 3 angles of two triangles have to be equal. But we have seen that, to draw a unique triangle we do not need to know all the 6 elements (length of all the 3 sides and all the 3 angles). We have concluded that we need a maximum of three elements. We have also found out these combinations (Table A). ‘Two triangles are congruent if two sides and included angle of one triangle are equal to the corresponding sides and included angle of the other triangle’. This statement is called ‘SAS (Side, Angle, and Side) Postulate on congruence’. Find the width of the pond given in the figure. Step: Have 2 poles (at A, B) on the edges of the pond, where you want to find the width. Have another pole (at C) on the ground in front of the pond, which is visible to both A and B. Extend AC to E such that AC=CE and BC to D such that BC=CD. By the above SAS postulate we conclude that the Triangles ABC and DEC are congruent. Measure distance DE to know the width of the pond. 6.4.3 Problem 2: In the adjoining figure PQRS is square. M is the middle point of PQ. 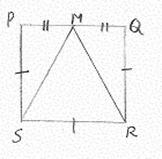 Since M is the middle point of PQ, PM=MQ. 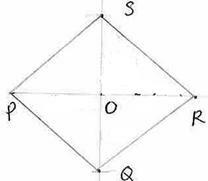 So we have two triangles SPM and MQR whose 2 sides and the included angles are equal. Therefore SPM MQR and hence their 3rd sides (SM, MR) are equal. Activity: Construct a triangle of AB=4cm and AC=BC=5cm (2 sides are equal). Measure the angles CAB and ABC. Do you notice that CAB = ABC? Observations: In a triangle, angles opposite to equal sides are equal. Let us prove this mathematically. The angles opposite to equal sides of a triangle are equal. 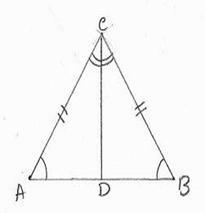 Construction: Bisect the angle ACB such that the bisector line CD meets AB at point D.
6.4.3 Problem 3: In the adjoining figure AB=AC. L and M are points on AB and AC such that AL=AM. Prove that ALM = AML. other triangles. Did you notice that the lengths of opposite sides are equal in all the cases? 6.4.3 Converse of Base Angle Theorem: In a triangle, the sides which are opposite to equal angles are equal. This proves the Converse of the base angle theorem. 6.4.3 Problem 4: Prove that in an isosceles triangle, the angular bisector of vertex angle bisects the base and is perpendicular to the base. 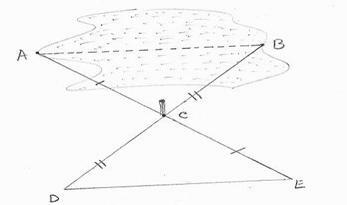 Construction: Bisect the angle ACB so that the bisector line CD meets AB at point D.
Activity: Construct few pairs of triangles such that the sides of a triangle (say 4cm,5cm,6cm) are equal to the sides of other triangles. Did you notice that they are all congruent? ‘Two triangles are congruent if the sides of one triangle are equal to the corresponding sides of another triangle’. 6.4.3 Problem 5: PQRS is a square. A, B, C, D are mid points of PQ, QR, RS and SP respectively. Prove that BAC= BCA. Since PQ=SR and A and C are mid points of PQ and SR, we have AQ=CR. Since B is mid point of QR, we have QB=BR. So we have 2 triangles, AQB and CRB, whose 2 sides are equal and included angles are also equal. By SAS postulate they are congruent and hence AB=BC and CAB is an isosceles triangle. Thus by base angle theorem, angles opposite to equal sides are equal. the common side of other triangles. Did you notice that they are all congruent? ‘Two triangles are congruent if two angles and common side of one triangle are equal to the corresponding angles and common side of another triangle’. This statement is called ‘ASA (Angle, Side, Angle) Postulate on congruence’. 3. Any 2 of the 3 angles can become the angles on the given common side. Since two triangles have corresponding angles equal and common sides equal, by ASA postulate, these triangles are congruent. on your side, such that BA is a straight line. 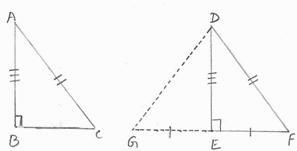 Erect a pole at some distance from A at C.
such that DE is perpendicular to AD and points B,C and E lie on a straight line. 1. BAC = 900= CDE (BA and DE are constructed perpendicular to AD). Thus 2 angles and their common side in BAC and EDC are equal. By ASA postulate, BAC EDC. Thus BA=DE. By measuring DE we get the width of river without getting into water. Therefore by ASA postulate, AEF and DEC are congruent triangles. Note that for congruency of triangles, at least one side has to be equal. corresponding side of the other triangle. Construction: produce FE to the point G such that GE=BC and join DG. This is also called RHS (Right Angle, Hypotenuse, Side) Postulate on congruence. 6.4.3 Problem 8: If the three altitudes of a triangle are equal, prove that it is an equilateral triangle. The perpendicular drawn from a vertex of a triangle to its opposite side is called altitude. 1. First draw a rough figure of the triangle ABC. 6.4.2 Problem 5: Construct a right angled triangle with base of length 3cm and hypotenuse of length 5cm. 6.4.2 Problem 6: Construct an isosceles triangle ABC with base AB = 6cm and altitude = 4cm. the altitude bisects the base. Here, we use the property of an isosceles triangle which states that, the altitude bisects the angle at vertex. Here, we use the property of an equilateral triangle which states that, each angle in an equilateral triangle is 600. This construction is equivalent to the construction 6.4.2.6 with angle at vertex = 600. 1. Every point on the perpendicular bisector is equidistant from the two given points. 2. Any point which is equidistant from the two given points, lies on the perpendicular bisector of the line joining these 2 points. This proves the second part of the theorem. The locus of a point which is equidistant from two fixed points is the perpendicular bisector of the line segment joining the fixed points. (Refer section 6.1 for definition of locus). 1. Every point on the anglular bisector is equidistant from the sides of the angles. 2. Any point which is equidistant from the sides of the angles lies on the bisector of the angle. The locus of a point which is equidistant from two intersecting straight lines is the angular bisector of the angle made by these lines. 1. The ratio of the areas of two triangles is equal to the ratio of the products of the base and it’s corresponding height, of those two triangles. Let ABC and DEF be the two triangles as shown in the adjoining figure. 2. Triangles of equal heights have areas proportional to their corresponding bases. 3. Triangles of equal bases have areas proportional to their corresponding heights. Theorem 2: If two angles of a triangle are not equal, then the side opposite to the greater angle is greater than the side opposite to the smaller angle. perpendicular line segment is the shortest.